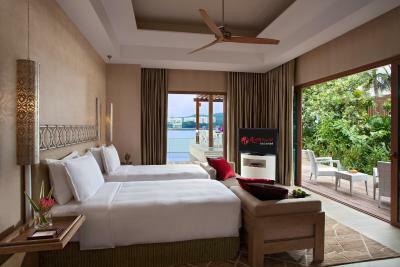 Lock in a great price for Resorts World Sentosa - Beach Villas - rated 8.5 by recent guests. Rooms were made up everyday without asking. They were very helpful with transportation and directions. Everything and especially our super nice butler Tun ! Private jacuzzi, soft wardrobes, in room breakfast very generous, scale and a lot of hangers. 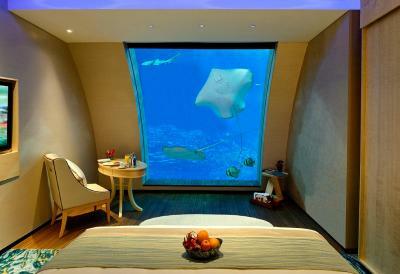 Bed was comfy, the ocean suite view of the acquarium is amazing. The butler service was fantastic. Every staff who attended to us was meticulous and always ready to help and go the extra mile. Staff were lovely. The Beach Villas are great for young families...be prepared for usual noise from kids. We were fine as we travelled with our son. The view to the aquarium is fantastic. This is the highlight of the Ocean Suite and the view was great. 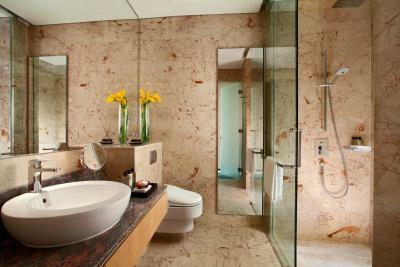 We got the Mica room which is specially designed by Mica for couple. Room is dark and cosy as compared to the other kind. My partner loved it a lot so that to me is a plus. An amazing experience. 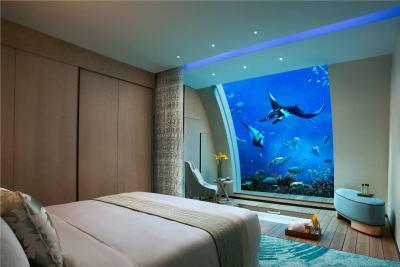 The personal aquarium screen with the sea creatures are definitely the main highlight. Can't wait to return. Reception was very accommodative to our complimentary (delicious) birthday cake and slightly later check out requests. Most of the staff - especially Adam, Kevin were very helpful and client oriented. Villa's are great - they create illusion staying in island beach resort, while you are literally next to the one of the biggest port cities! 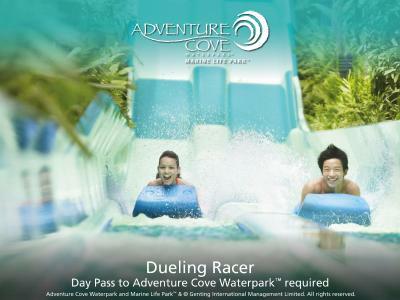 Definitely good for long family stays while visiting all the attractions of Sentosa and Singapore. 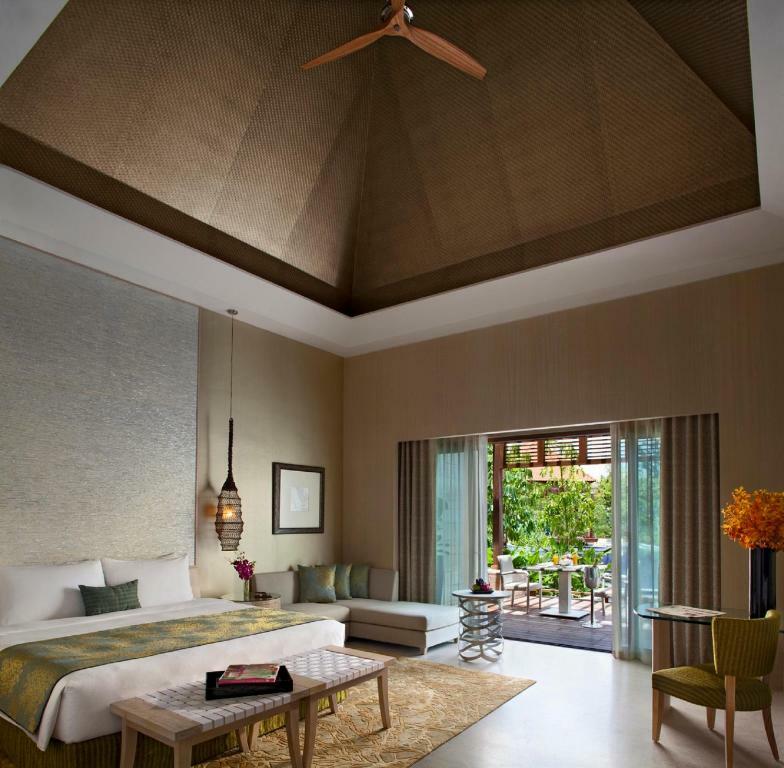 The luxurious Resorts World Sentosa - Beach Villas provides a charming collection of air-conditioned villas with private pools. With panoramic views of the sea and the surrounding forest, all villas also have a Nespresso coffee machine, an iHome system and a comfortable Simmons bed. 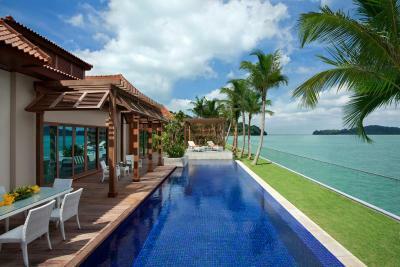 The private villas are situated on the western tip of Sentosa Island, its spacious pool terrace surrounded by tropical greenery. 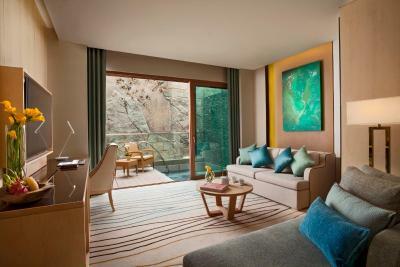 A flat-screen TV, duck feather pillows and free mineral water are included. 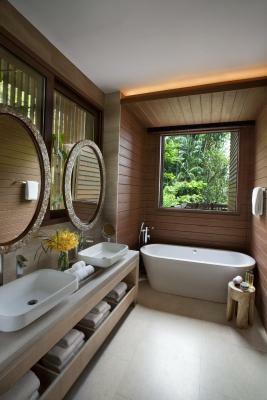 The en suite bathroom has a rainshower and a relaxing soaking tub. Dental kit and free toiletries are available. 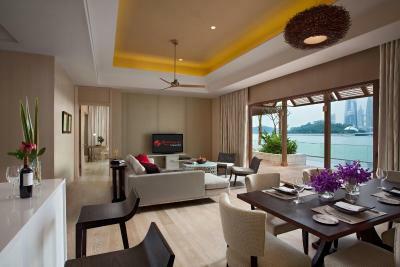 The Beach Villas are located within Resorts World Sentosa, which houses Universal Studios Singapore, the S.E.A. 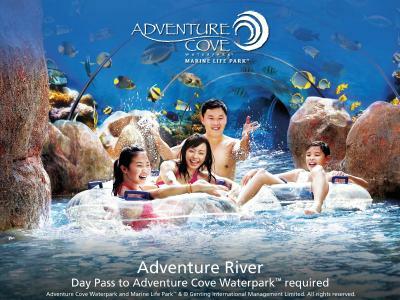 Aquarium™ and Adventure Cove Waterpark™. It is a 7-minute walk from Festive Walk and Resorts World Convention Centre. 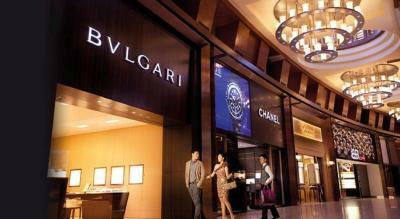 Vivocity Shopping Mall is a 5-minute drive away. Transport buggies and personal 24-hour butlers are provided for all guests throughout the stay. 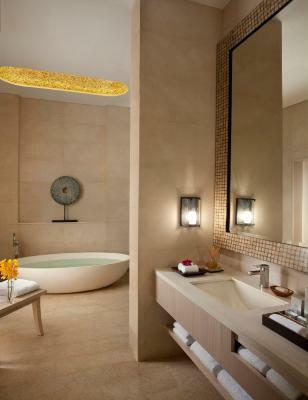 Guests can also exercise at the gym, swim in the outdoor main pool, or relax with a massage at the 5-star ESPA. 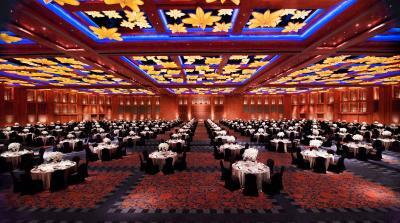 Dining options are available at Resorts World Sentosa - Equarius Hotel, less than a 5-minute walk away. Friendly staff are fluent in English and Chinese. 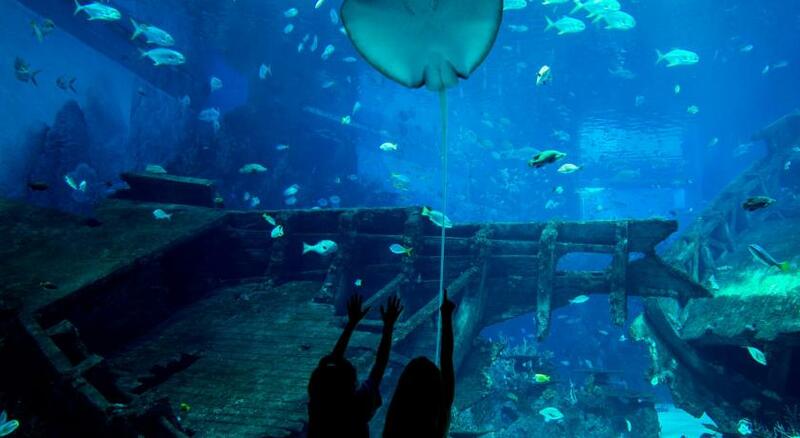 Sentosa Island is a great choice for travellers interested in Universal Studios, clean streets and food. 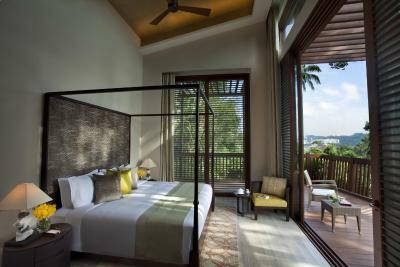 Resorts World Sentosa - Beach Villas has been welcoming Booking.com guests since 14 Feb 2012. 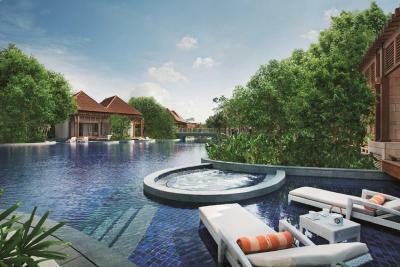 When would you like to stay at Resorts World Sentosa - Beach Villas? 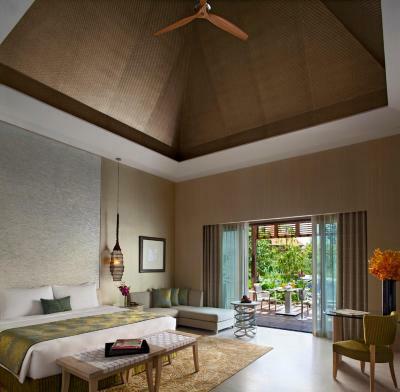 Spacious villa offers access to an exclusive dip pool, a comfortable Simmons "Cool Max" bed and a Nespresso coffee machine. 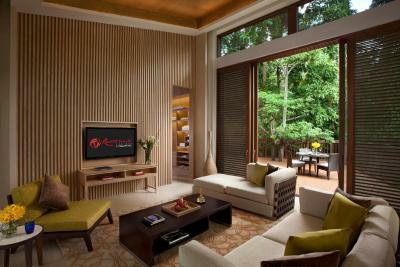 In the living room, guests can enjoy cable channels on the flat-screen TV while sipping a cup of TWG tea. The en suite bathroom has a large soaking tub. This spacious two-storey townhouse comes with a comfortable Simmons "Cool Max" bed and a Nespresso coffee machine. The upper level has an open-concept living area with an outdoor patio and a hot tub. 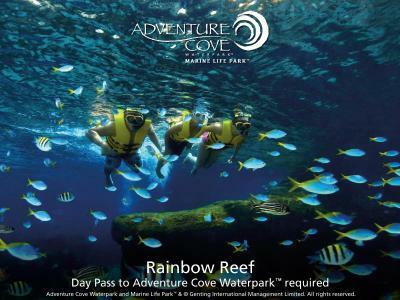 The lower level offers guests an underwater view of over 50,000 marine fishes. 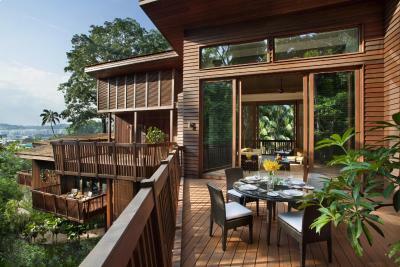 This villa features a balcony, minibar and iPod dock. This villa has a sofa, flat-screen TV and minibar. An escapade in a tropical paradise doesn't get better than this, with your own private villa, lavishly appointed to surround you in understated luxury, with an assigned Butler who will personally attend to your every request, no matter how big or small. Property surroundings – This neighbourhood is a great choice for travellers interested in Universal Studios, clean streets and food – Check location Great location - show map Guests loved walking around the neighbourhood! 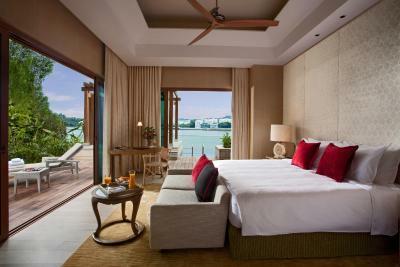 House rules Resorts World Sentosa - Beach Villas takes special requests - add in the next step! One older child or adult is charged SGD 82.39 per person per night in an extra bed. Resorts World Sentosa - Beach Villas accepts these cards and reserves the right to temporarily hold an amount prior to arrival. 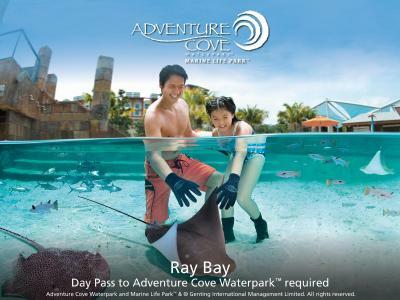 Bag checks will be conducted prior to entry to Adventure Cove Waterpark. 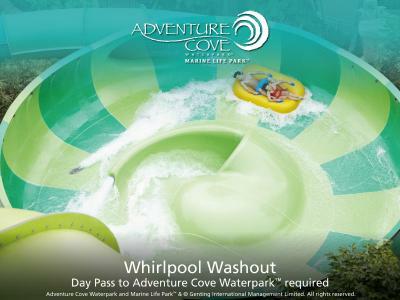 Upon check-in, guests will be provided with complimentary Sentosa Pass (monorail) to enjoy unlimited transportation between Sentosa Island and Harbour Front (VivoCity). Prepayment for non refundable bookings will be charged by "RWS Call Centre". All guests can enjoy complimentary parking during their stay, limited to one exit from the hotel per day. Room reservation charges will be charged upon check-in. Credit card provided upon reservation is for guarantee purpose. For reservations made with inclusive breakfast, please note that breakfast is applicable only for number of adults paid in the room rate. Any children or additional adults are charged separately for breakfast and are to paid directly to the hotel. Please note that the full amount of the reservation is due before arrival. 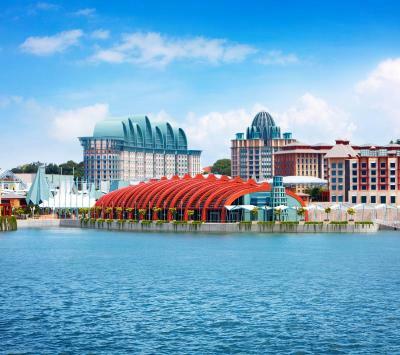 Resorts World Sentosa will send a confirmation with detailed payment information. After full payment is taken, the property's details, including the address and where to collect keys, will be emailed to you. Staff was not helpful enough to explain more about the rooms and checking in was bit too long as ony 2 staff were actually active during the 'peak' /'checking in' hour. Buggy was too long of a wait till i decided to walk and find the room myself! The room link to swmgpool and thats about it. Most staff were friendly and helpful. There were however staff that are not. One of the Butler that served us called Shek was rude and arrogant. I love everything here. Probably will come back again. The staffs there are so friendly and helpful. They always try their best to get what I want. They called me 2 days before I check in to guide me how to go to the hotel. And also help me to prepare the surprise for my boyfriend. Again, thanks a lot! The service could have been better. With the price point, guests should have better service. Firstly, the concierge didn’t do a good job directing us to park at the right place and we had a hard time finding the car park. Secondly, we called for buggy but after 30mins, buggy still did not turn up. We called for fresh towels as we did not even have Housekeeping clean our room. After an hour, towels were not sent and we had to call again.